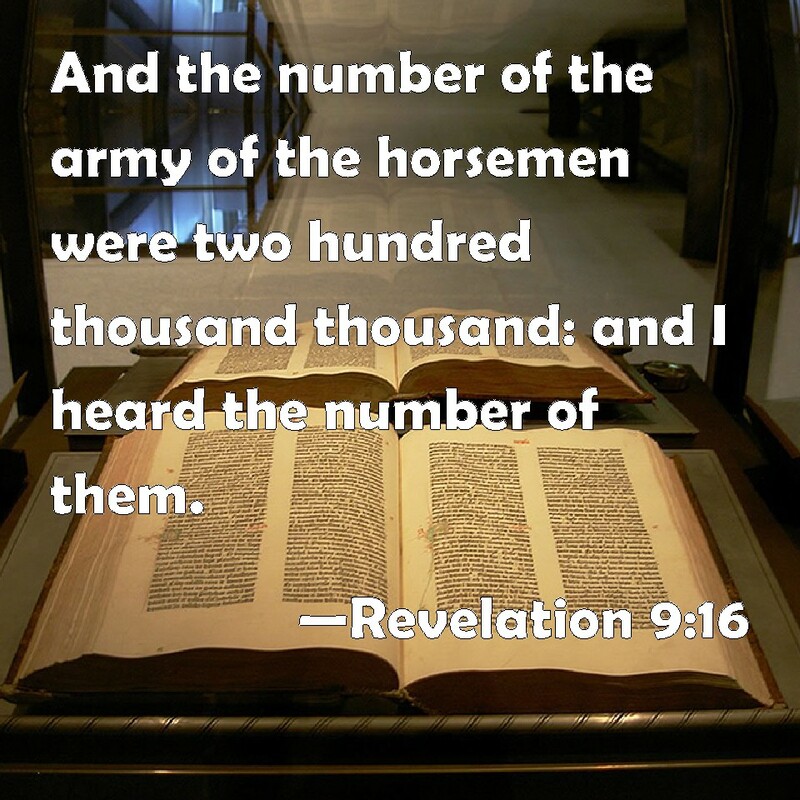 One of the most mysterious and awesome mental pictures in the Revelation is that of Rev.9:16 –the two hundred million horsemen. What does this mean? Who are they and what do they represent? Do not worry, the Lord through His restoring prophet comes through for us. Let us look at this subject. THE REASON FOR THE CONFUSION. “Do not read the Word in the light of former opinions; but, with a mind free from prejudice, search it carefully and prayerfully. If, as you read conviction comes, and you see that your cherished opinions are not in harmony with the Word, do not try to make the Word fit these opinions. Make your opinions fit the Word. Do not allow what you have believed or practiced in the past to control your understanding.” — Messages to Young People, p. 260. Adding To and Taking From the Scriptures. “To begin with, the reader’s attention is called to Elder Uriah Smith’s book, originally entitled Thoughts on Daniel and The Revelation, and later Daniel and The Revelation, in which is explained, among other subjects, the subject of “the seven trumpets.” Here one will notice that Elder Smith is not the original author of the exposition of the trumpets. The originators were Messrs. Keith, Clark, Barnes, et al. “Thus far,” says Elder Smith, “Keith has furnished us with illustrations of the sounding of the first five trumpets.” — Daniel and The Revelation, p. 506. Then further in the same chapter, and in explanation of Revelation 9:17, we read: “As the Turks discharged their firearms on horseback, it would appear to the distant beholder, that the fire, smoke and brimstone issued out of the horses’ mouths, as illustrated by the accompanying plate.” — Id., p.510. “Barnes thinks this was the case,” remarks Elder Smith; “and a statement from Gibbon confirms this view.” — ld., p. 510, footnote. Thus, plainly, the interpretation of the seven trumpets, as it is found in Thoughts on Daniel and the Revelation, was not originated by the Seventh-day Adventist denomination. But their placing upon it their endorsement makes it appear as Seventh-day Adventist doctrine. In other words, the theories of uninspired men having the S.D.A. stamp of approval, are made to appear to the S.D.A. laity as genuine S.D.A. Bible doctrines. This goes to show that the majority of Seventh-day Adventists, right along with others, do not ask, “Is it true, — in harmony with God’s word? but, By whom is it advocated?” — Testimonies to Ministers, p.106. And if the theory comes through a popular channel, they as a rule unquestionably accept it! But even worse, they unhesitatingly agree that the “fire,” “smoke,” and “brimstone” did not issue, as John saw them, from the lion-like mouths, but rather from a gun in the hand of a Turk! True, the seer of Patmos was an erring human being like ourselves, but the one who dictated His writings — the great and infallible I Am, Overseer and Proof Reader of the Scriptures — was there to see that John made a faithful record of what he saw, for the exact truth of the symbolism means our very life. Indeed, it is not possible that the Lord would jeopardize our salvation by displaying the symbolism so far removed from John’s sight that he could not accurately see and record it, and yet expect to save us by it. The acceptance and the teaching of such interpretations is signboard evidence that there is today gross darkness throughout the church, enveloping both the laity and the watchmen who claim to be the “men of experience” mentioned in Testimonies, Vol. 5, p. 293, and elucidated in Tract No. 4, The Latest News for Mother Revised Edition, pp. 32-35. These men, though exceedingly “unskilful in the Word,” as is seen from the foregoing observations, forbid that anything new in which they see no light, be brought before the people. Rev. 9:15, last part. “…which were prepared for an hour, and a day, and a month, and a year, for to slay the third part of men.”…. …to My holy mountain Jerusalem,…in a clean vessel into the house of the Lord.” Isa. 66:19, 20. “Lift ye up a banner,” saith the Lord, “upon the high mountain [God’s holy church], exalt the voice [the proclamation of the gospel] unto them, shake the hand, that they may go into the gates of the nobles. I have commanded My sanctified ones [the ministry — “two hundred thousand thousand” “horses”], I have also called My Mighty ones [the angelic host — “two hundred thousand thousand horsemen”] for Mine anger, even them that rejoice in My highness. The noise of a multitude [the army of Revelation 9:16] in the mountains, like as of a great people; a tumultuous noise of the kingdoms of nations gathered together: the Lord of hosts mustereth the host of the battle. They come from a far country, from the end of heaven, even the Lord, and the weapons of His indignation, to destroy the whole land. So there we have it the two hundred million horses are gospel workers. The horsemen, the riders, are the angelic host, divine beings, guiding them in proclaiming the message and then executing God’s judgment upon the wicked. Wow, this packs a “truth punch” doesn’t it? The Loud Cry of the 144,000 will soon produce 200 million gospel preachers! Although we now have a little over 7 Billion people on our planet, the 144,000 and the gospel workers will reap a harvest known as the “Great Multitude” which no man could number (Rev. 7:9). What a time to be alive and witness what God’s full Spirit poured upon His vanguard the “first fruits” and His “great army of gospel workers” can do. Let us thank the Lord for our understanding of this most mysterious and long-held confusing topic. His promise to restore “all things” including the full truth of the Scriptures is a real blessing for those of us interested in prophecy. This entry was posted on September 23, 2017 at 5:31 am and is filed under Elijah Interpretations, Revelation teachings. You can follow any responses to this entry through the RSS 2.0 feed. You can leave a response, or trackback from your own site.